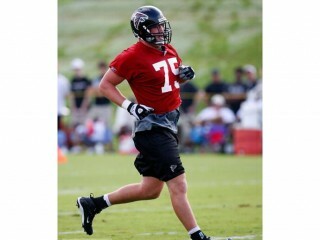 Garrett Reynolds is an American football offensive tackle for the Atlanta Falcons of the National Football League. Garret is the nephew of former 49ers linebacker Jack “Hacksaw” Reynolds. Selected as a fifth round (156th overall) draft choice by Atlanta in 2009. Saw action in five contests and was inactive for the remaining 11. Competed primarily on special teams, but also saw action on the offensive line against Buffalo (12/27). A second-team All-ACC selection who started the last 26 games at right tackle. Consistently graded out as the team's top offensive lineman. Posted a 92 percent grade and eight knock-downs at Maryland. Started 19 career games at right tackle, including all 12 in 2007. Had a team-best 88 percent grade and a team-high 51 knock-down blocks on the season. Posted a 90 percent grade with four knock-downs in the win over Miami and was named ACC Lineman of the Week and co-offensive player of the week by the UNC coaches. Started seven games, including six at right tackle and one at right guard. Made his first career start at right guard against Duke. Made his first career start against Rutgers at right tackle and had four knockdown blocks. Played in nine games as reserve offensive tackle. A second-team All-ACC selection by the Associated Press and first-team All-ACC pick by The ACC Sports Journal following his senior season. Was named to the '08 Lombardi Award Watch List. Attended Carter High School and ranked among the top 15 players in Tennessee by Rivals.com and SuperPrep. Named all-state at defensive tackle in 4-A schools and was an Associated Press honorable mention all-state selection on offense. A three-year starter on both the offensive and defensive lines while contributing with 76 tackles on defense as a senior. Uncle is former Rams and 49ers linebacker Jack "Hacksaw" Reynolds. View the full website biography of Garrett Reynolds.